I really enjoy creating various sized cards. Some stamps just can use that little extra space to show them off. 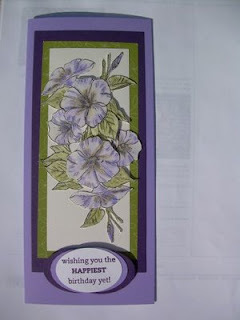 The Morning Soft stamp was stamped twice on watercolor paper and cut into various shapes to use on this extra long card. I made it for a very dear friend who is only 12 plus hours older than me. You have until Sunday to purchase retired stamps at 10% off. The new catalog starts on Monday, January 19Th. Take one last look at the Fall/Winter catalog to make sure you haven't overlooked a stamp set that you had wanted.